Walnut colored furniture is one of the most popular segments in the production of interior items for a reason. Deep shades, expressive natural pattern, strength and ductility of the material attract both masters of the furniture making and manufacturers of finishing materials. A wide palette of shades – from pale “honey” tone to a very dark deep mahogany, walnut furniture for the modern interior decoration can transform almost any room – starting from classic to cutting edge one. Not only furniture but also doors, flooring, wall panels, countertops, decorative elements and picture frames can be made of walnut wood. Many homeowners by their own or with the help of professionals would like to bring the warmth of natural materials in the interior of their homes. Let’s try to understand what interior decoration, color palette, fabrics and décor it is more efficient and attractive to combine variations walnut. If the basis for decoration of premises is walnut color, you need to prioritize the use of shades and clearly allocate proportions. If to put more simply, the “nut topic” in the space can act in two variations. The first type involves the use of a nut dominant – it is one of the wooden types becomes the basis of furniture – a kitchen set for example. Such space design requires a great natural and artificial light – big windows and a multi-stage lighting system in this case will help you to keep warmness of the natural material. The second option is the use of shades of walnut – the so-called “nut-companion” effectively complementing the basic environment of space and often acting as an accent or mitigating of existing design brightness. Not every kitchen space is able to take harmoniously a whole ensemble of furniture made of walnut. Beautiful natural pattern of the nut goes well with light colors and serves as a contrasting dark accent in this case. Using a dark walnut color for the execution of the lower tier of the kitchen cabinets and for the base of the island in a complex with a light top furniture set allows not only creating colorful and practical ensemble, but also visually increasing the height of the room. Pronounced natural nut pattern needs no decor. Therefore, the majority of kitchen fronts made of this material are presented in a totally smooth form or accompanied by very simple and concise furniture, unable to divert attention from the main element of the furniture ensemble. For the same reasons, it is better to choose plain countertops for kitchen furniture, eliminating variations on the subject of stone (or its imitation) with no less rich natural texture – veins and shimmering, changing of hues and colors. Another way to use walnut in the kitchen space is floor facing worktops manufacturing. Tore present the natural wooden pattern most advantageously, it is recommended to use wood countertops in conjunction with light, monochromatic facades of the kitchen cabinets. The combination of materials with tabletops and floors allow harmoniously complete the image of the room for cooking. Bright and spacious dining room is perfect for applying dark, deep shades of walnut. The rigor and clarity of a dining group is would have particularly advantageous look at the bright background of flooring, white walls and sunlight flooding through the panoramic windows. Walnut is quite pliable material for furniture. Strong, but flexible natural material allows you to create original forms – chairs on curved legs, tables and stands of the elegant design, the original back for the mini-chairs. Dining table of walnut itself looks luxurious, well-and a little vintage. Its massiveness is located in a pleasant neighborhood with its naturalness. This practical element of the interior can become a focal point of contemporary design, gathering furniture and decor items designed in a completely different manner around it. And herewith the whole composition will look harmonious, original and functional at the same time. Brown- honey nut shades are perfectly inscribable in almost any interior style. Modern motifs in the design of the kitchen or dining room harmoniously take natural heat, where stainless steel appliances, glossy facades, glass surfaces and plenty of built-in lighting are opposing it. An original furniture group of luxurious Milanese nut can become the decoration for breakfast and other short meals area. Curved legs of a small table, an elegant execution of countertops, a comfortable, but at the same time aesthetically pleasing chairs – such an ensemble with colorful coloring will look great in a warm and bright atmosphere. Installed at the window furniture is basking in the sun, giving us the opportunity to see the unique natural material pattern in all its glory. Nut trees of different species have a distinct structure, its natural pattern is so attractive and unique that designers often use simple and concise forms in the manufacturing of furniture. Strict façades without decoration, often with hidden fittings, are able to be a highlight of the interior only because of unusual texture of the material. It is better to choose plain, neutral shades, light colors as the most harmonious background for such a colorful natural pattern. Honey walnut shades blend perfectly with the natural furniture and wall trim hues – orange, light green, yellow-ocher, mustard color will create a truly comfortable, relaxing and pleasant atmosphere, which will be comfortable for everyone. Visual expanding of the living room space, including increasing the visual height of the ceiling in the room, can be achieved by applying a dark, deep shades of walnut for the execution of low furniture (such as chests of drawers and other small modular solutions), as well as flooring in combination with a light wall finish and snow-white ceiling execution. Nut dominant in the living room is a luxury. It is permissible only in really spacious and bright rooms. If your living room has not only a large area, high ceilings, but also panoramic windows that fill the room with sunlight, – in this case, the use of wood panels for the walls (and even the ceiling) can become a highlight of the interior. But even in a large room it is better not to use the entire surface for processing by a walnut. Leave at least one, accent, in this case, wall with a light finish. If the use of walnut furniture in the living room is too bold step for you, try using beautiful natural pattern of durable and colorful material as a facing material for a floor. Of course, the floor board of a natural walnut is not only eco-friendly, beautiful and safe for people, but also quite expensive. There are plenty of variations of different walnut laminate shades in a broad sell. Such floors design brings the natural notes of warmth into any interior of the living room. Harmonious completion of the family space image will be coffee table selected in the color of the flooring, which is set in the center of the recreation area with upholstered furniture. Another possibility of using walnut wood in the space of the living room is the space decoration around the fireplace, built-in shelves or just open shelves, frame for mirrors, paintings or photos over the hearth. Symmetry, luxurious deep color of the wood and the flames – everything will look harmoniously together, bringing balance and comfort into the room’s atmosphere. In the sleeping room, as in no other, walnut looks especially organically. Whether walnut would be dominant in the interior or would act as local insertions – its presence in the design of the sleeping room always brings notes of warmth and comfort, tranquility and relaxation we all need after a hard day in preparation for sleep. If you decide to use a dark walnut to fulfill not only the main element of the interior of your bedroom – the bed, but also the rest of the furniture in the room, for example, cabinet, chest of drawers, dressing table and bedside cabinets, – you should understand that such a “heavy artillery” can be used only in spacious and bright rooms. If your bedroom has high ceilings and large windows, the dark colorful furniture shades on the background of bright finishes (and even flooring) will look luxuriously, advantageously and unique. Dark chocolate walnut shades look very expressive and contrasting. But such elements should not be too much in the interior of the bedroom. If you select a similar color for bedside tables, dressing table, or outline the work area within the sleeping area in such fashion, it is necessary to accommodate the furnishings on a light background. In this case, the use of pastel palette and even white color finishing solutions for virtually all surfaces of the bedroom is justified more than ever. An original way to design bedrooms will become the use of wooden wall panels for lining of the headboard surface. We demand warmth and comfort in the sleeping room. This comfortable environment should foster a supportive preparation for sleep and joyous awakening every day. It is this attitude can be given to a modern interior by natural finishing material. Accent wall, decorated using walnut panels is impressive itself, but together with wall decor it will look like a real coordination and semantic center of the room for sleep and rest. The use walnut color furniture items even in the bedroom for a newborn, little child or adolescent can be not only justified, but to create a very special way of facilities. Beds and cradles for babies, bunk designs for two children and full beddings for teens can be supplemented by small chests of drawers, tables, bookshelves and storage units in different modifications. 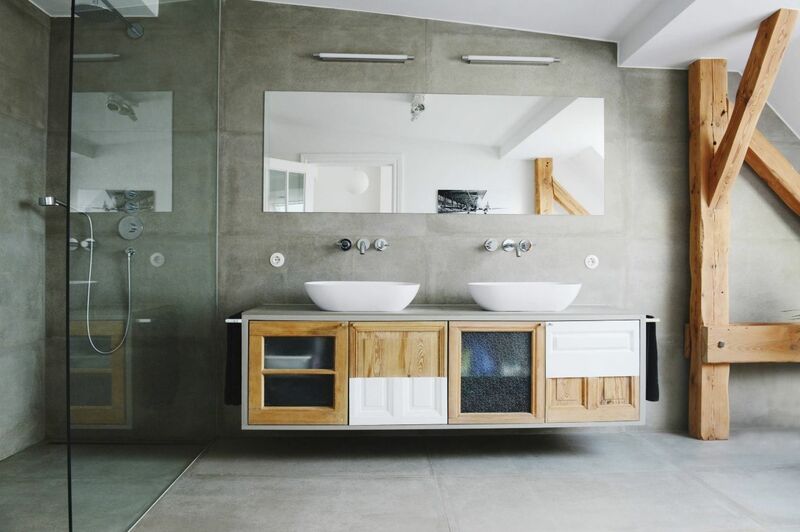 and of course bathroom furniture should be attractive, be appealing to you and your family. If it is not necessary to talk about the external beauty of the walnut – anyone can approve it. But it is necessary to use special moisture repellent formulations to protect the material from moisture. Unfortunately, we would have to sacrifice the naturalness of the material to protect the products. Films, sprays and gum, which impregnate the pieces of furniture for bathrooms, do not alter the natural pattern or color of the wood. Bathroom in chocolate-honey tones is a haven of relaxation and tranquility. Nice eyes, natural colors will soothe and relieve stress, clear your mind, while you clean the body. Different shades of brown, not only in furnishings but also decoration of the room, can create totally unique atmosphere. The combination of brown-honey nut shades in the execution of storage and countertops in the kitchen sink area with brick masonry consistent in the same color theme has allowed creating harmonious and non-trivial image of utilitarian premises. If you want to interpret the traditional English style in a modern home office interior, you can easily combine walnut wood with blue, emerald shades, use Marsala color, bottle-green paint. Warm color temperature of furniture solutions will balance the cool palette of finishes and lead to the creation of harmonious, but the original design of the workplace. If using walnut wood, you’d decide to ornate not only furniture in the room, and the floor covering, doors and other items, you need to take care of the lighting system at several levels. This space can’t do with just one central chandelier. It would be better if the light can be reflected from bright surfaces finishes, glass and mirror surfaces (cabinet doors, countertops and wall decor items) multiplying and visually expanding the space. And the basis of this concept should be better constituted of not dark but honey, or even sand and golden hues of natural material types.